Once again, we took our time waking up, because we knew that today was going to be a short (but tough) day of hiking. We had 2300 feet of elevation gain to contend with, which wasn’t bad, but it was compressed into 1.5 miles of actual distance. That’s just shy of a thirty percent average grade! Tough, in other words. 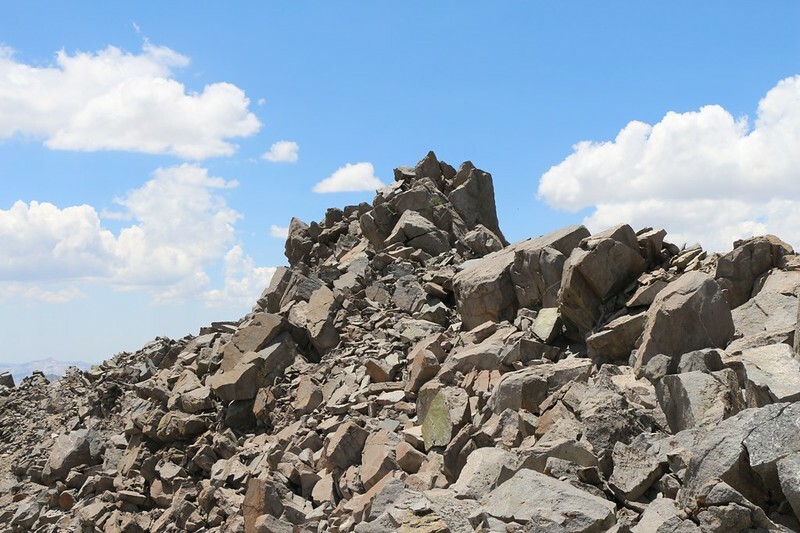 And much of that climbing would be on rocky blocks of granite, not a nice smooth trail. Luckily, we had all day to do it. 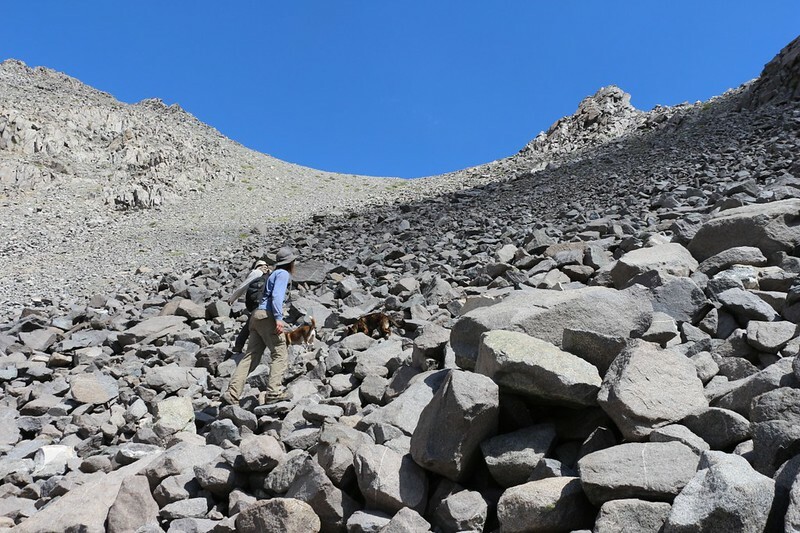 Our main concern was for the dogs: Would they have difficulty on all that steep, uneven rock? They’d been amazing climbers thus far, but there was only one way to be sure. We ate breakfast and prepared our day-packs. It was nice to leave our tents alone for another night. This spot was to be our “Base Camp” for our “assault” on Cloudripper. The guys liked the way that sounded, even though it’s a bit misleading to describe Class 2 hiking as an assault. 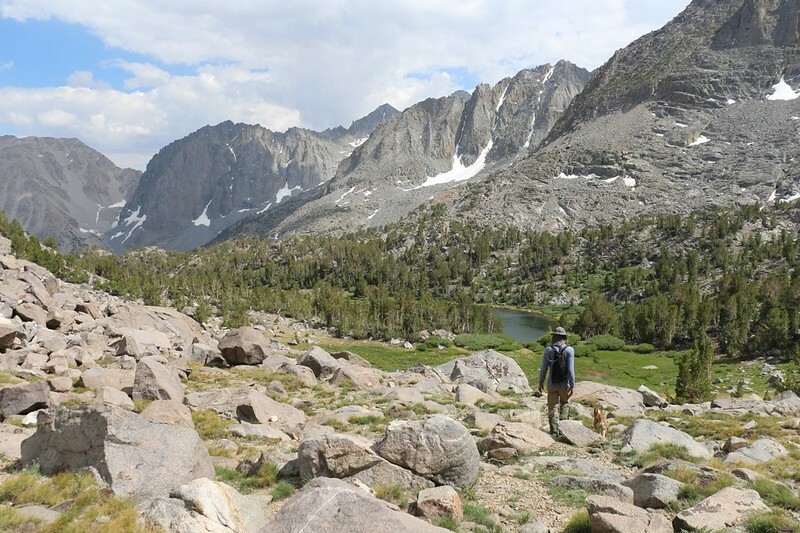 We grabbed our gear and headed over to the inlet stream to filter a bit more water, then headed up the streambed toward the saddle. 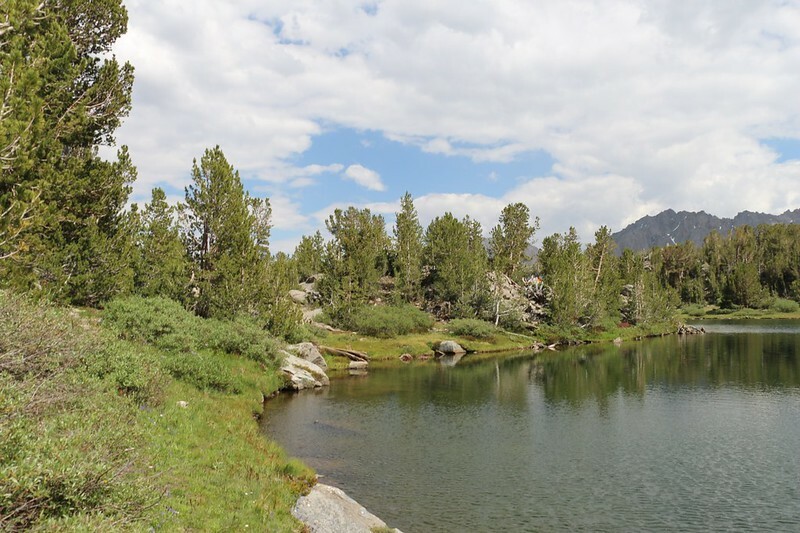 Once we passed the first stand of pine trees surrounding the lake, our visibility became unobstructed. We were near the treeline at this altitude and the vegetation became low and tundra-like. Easy walking, but uphill, with plenty of easily-avoidable boulders poking up through the grasses and scrub. 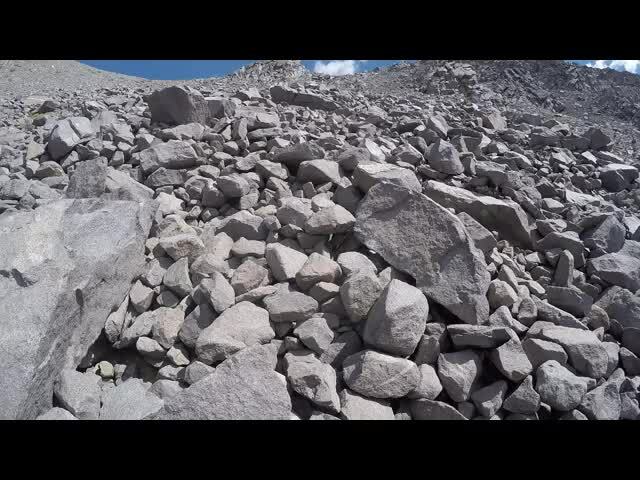 Until we reached the big talus pile below the saddle. That’s when the climbing got serious. And steep. 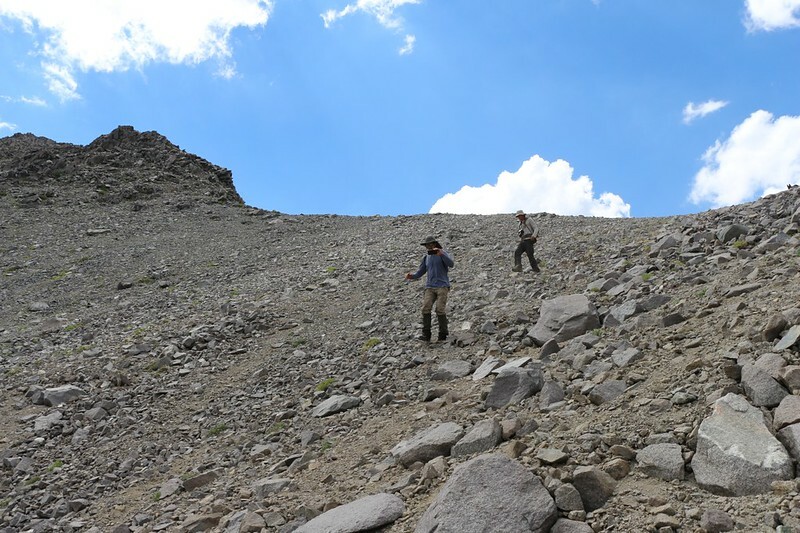 The larger talus on the right side was much better than the loose scree down the center, but it also required plenty of big steps, and a lot of zig-zagging to stay on stable blocks of rock. It was a challenge to avoid wobbly and shifting stones, but the more we did it the better we got at it. Soon, we were pausing and panting as our heartbeats rose with the exertion. 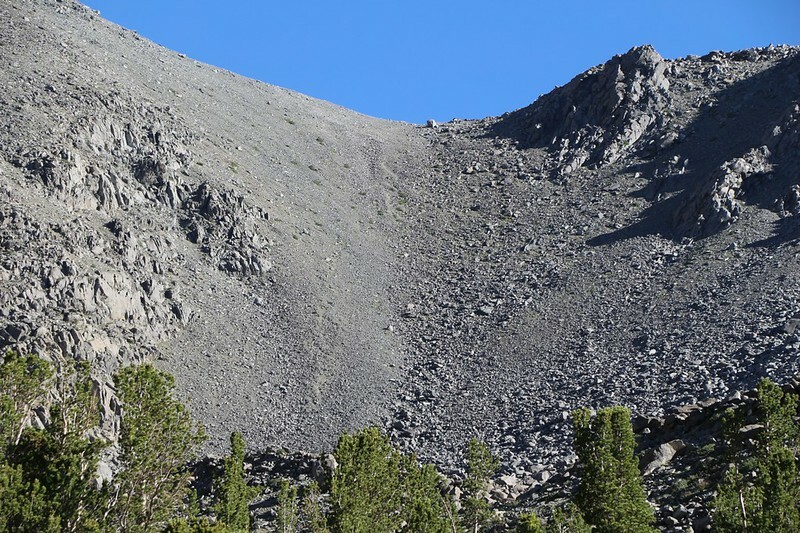 We had six hundred feet to climb on this section, and even though it looked insurmountable from the base, eventually the saddle drew closer and closer. Finally we crested the top! We paused there for a good long break, cooling ourselves in the breeze and eating some snack. The dogs were happy to take a breather, as well. We got out their water bowls and gave them some doggy-snack, too. It turns out that they were far better (and faster) talus-jumpers than we were! That was reassuring, and we figured that all we really had to be concerned about now was the final summit block. But we’d worry about that later. I wandered back and forth on the saddle, taking photos. 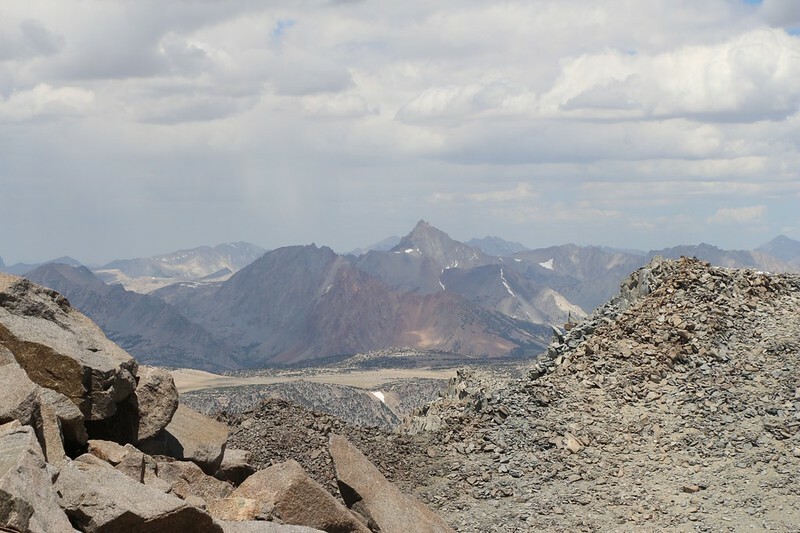 We were up at 12,300 feet, the same height as we were two days ago near the Palisade Glacier, and the view was stunning. I could barely wait to climb higher. 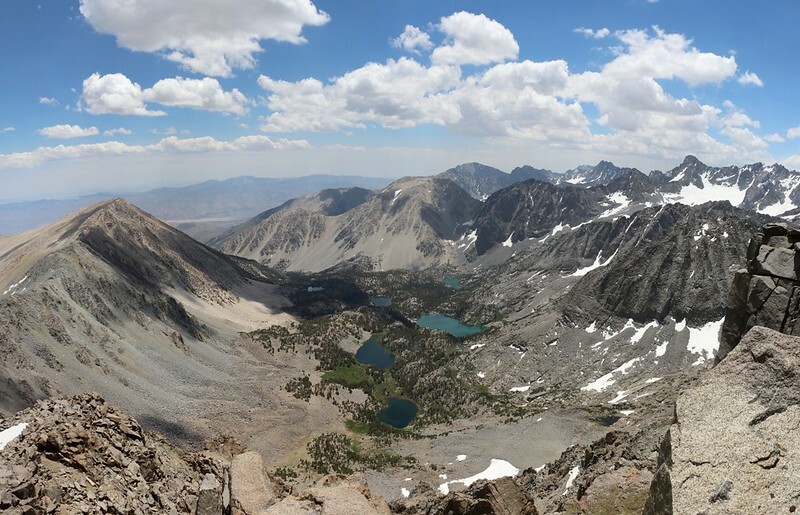 The view southeast into the Big Pine Creek basin was superb, and we could see many of the lakes shining blue down below us, surrounded by the fourteeners of the Sierra Crest. 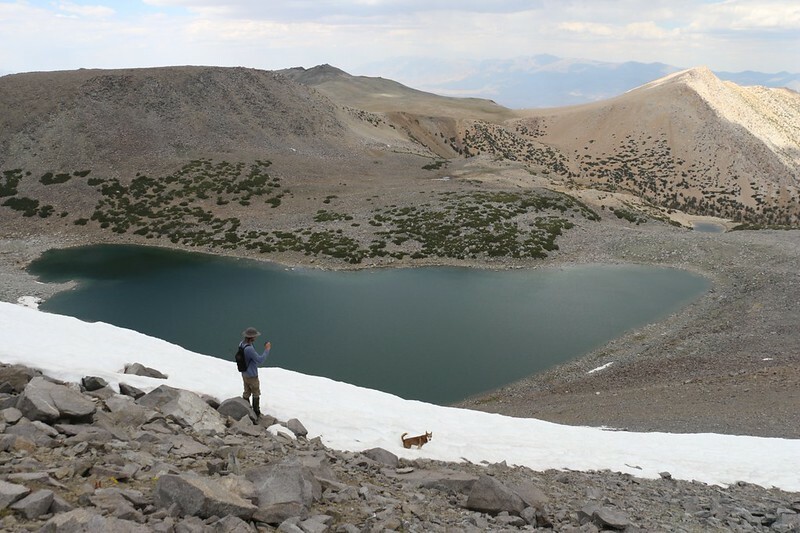 To the north, directly below us, was Thunder and Lightning Lake, which had that glacial turquoise color we’d seen before. 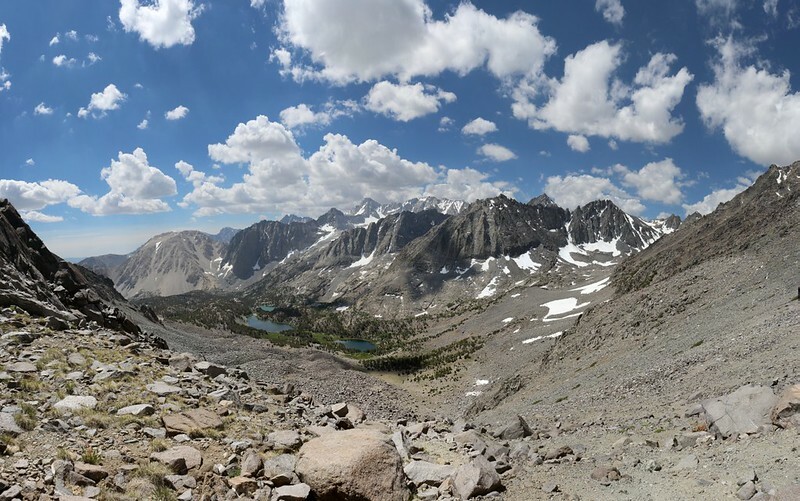 Panorama view from the saddle east of Cloudripper Peak – elevation 12300 feet – and the view is awesome! The saddle marked the halfway point, and when I checked my GPS it said that we’d only hiked at about 0.5 miles per hour. This crawling speed was understandable, considering the terrain, but it still seemed pathetic, somehow. We thought that we were tougher than that. So we resolved to do better on the second half. 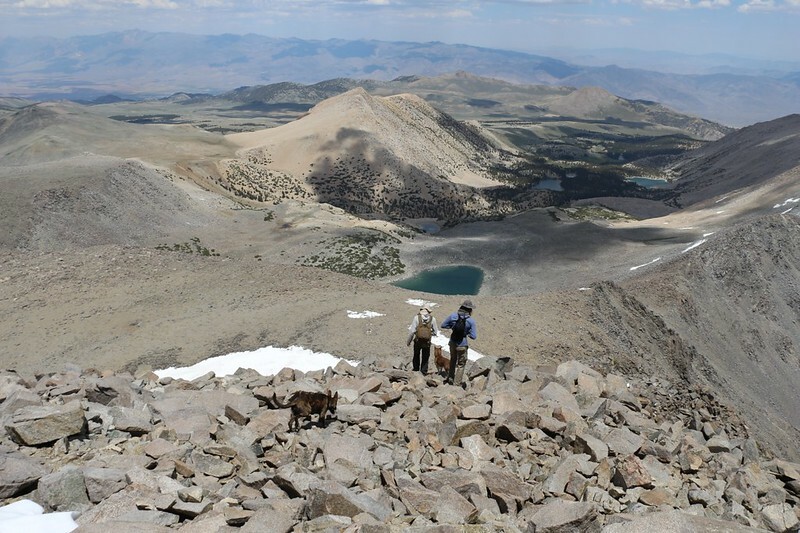 The climb along the ridge started out steep and rocky. There were cairns to mark the path, and scuffed marks in the soil where others had hiked before, so the route-finding wasn’t too tough. And when in doubt we could use the “Rule of Up” and simply scramble on the granite blocks. The mountain’s rock was very thoroughly fractured, and the underlying bedrock rarely showed itself. So, once again, we were essentially hiking on a form of talus. But that was OK with us. It was the occasional patch of steep loose scree and the deadly drop-offs below us that were scary. But we took our time and everything worked out OK. Meanwhile, there were excellent views in every direction. I was stopping to take photos and videos constantly. This was also an excuse to catch my breath, because the air kept getting thinner. There were large patches of melting snow on the north slope of the mountain, and we got to watch the dogs having fun on it. Their claws worked much better on snow than solid granite. All in all, we agreed that hiking along this ridge was a lot of fun. 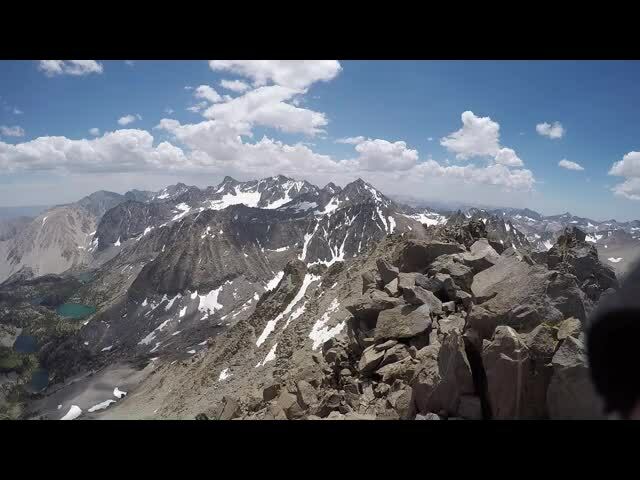 GoPro panorama video from the ridge at about 13000 feet elevation. 500 feet more to go. 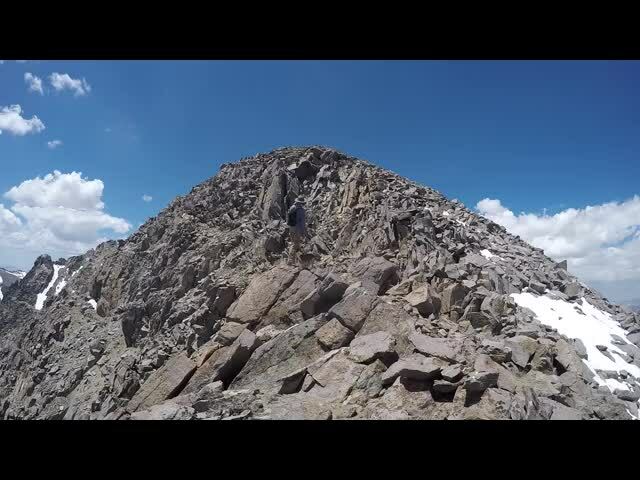 It was a long ridge. But eventually we reached what was obviously the highest point, the summit of Cloudripper. And it wasn’t a Summit “Block” per se; it was more of a Summit Pile of Blocks. But that was OK with us, provided we could climb up to the top. 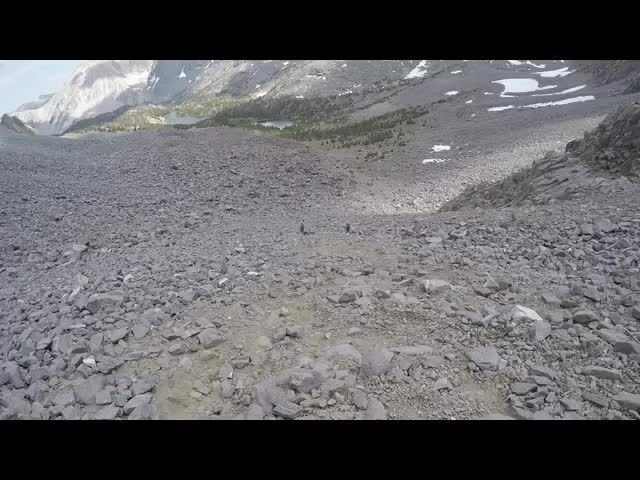 As we approached, we realized that the dogs might not be able to make it. 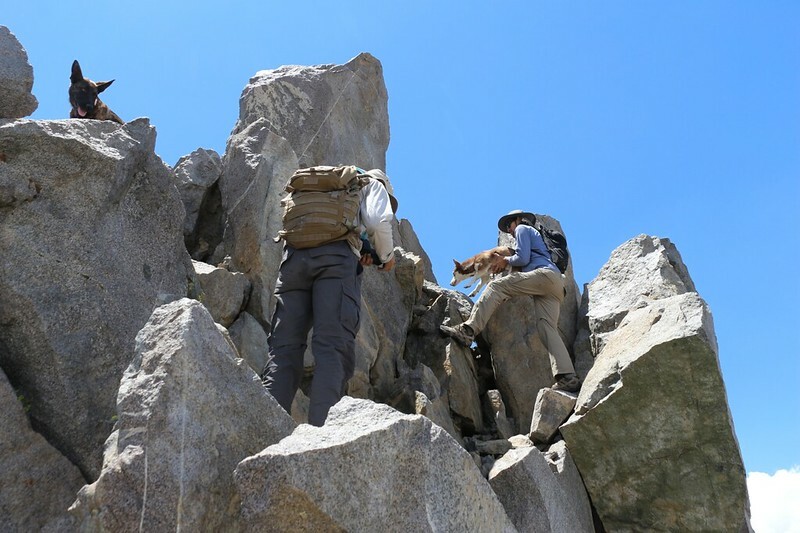 Thus far, they’d had the occasional difficulty with route-finding over the uneven talus, so that we had to show them the best way around a big boulder or gaping crack (their doggy-brains always wanted to travel via the most direct route), but they made it the entire way on their own power. 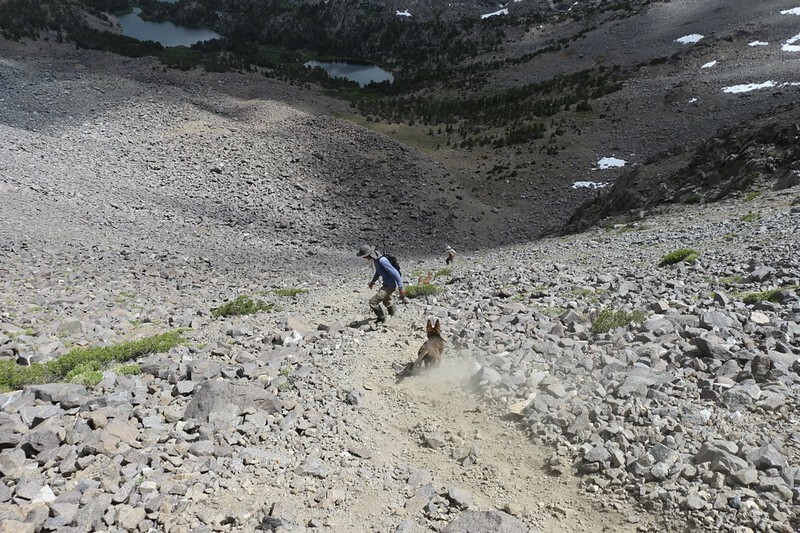 As we climbed the final extra-steep section, the dogs began to whine a bit, because it was (let’s face it) way too scary for them. 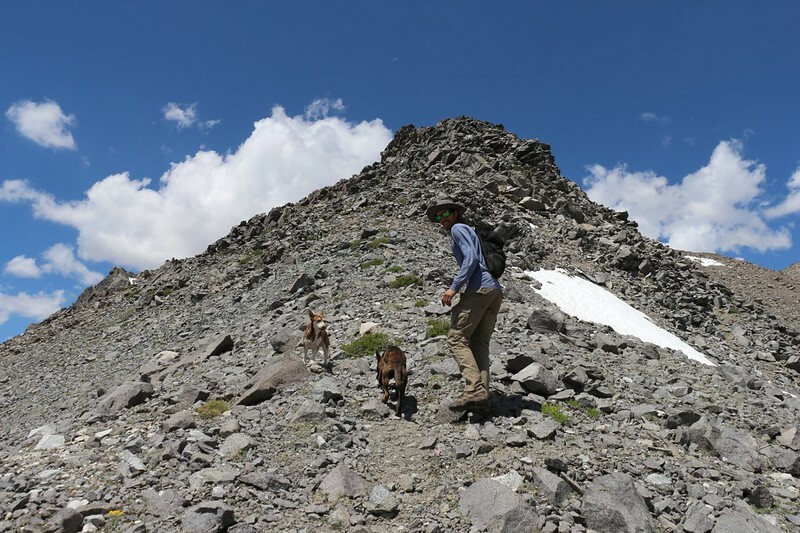 And that’s when we formed a human bucket-brigade, picking up the dogs, carrying them upward, and passing them on to the next man, who deposited them on the summit itself. Hooray! We made it! The view from the top was truly excellent. You can be certain that I took plenty of photos and videos. 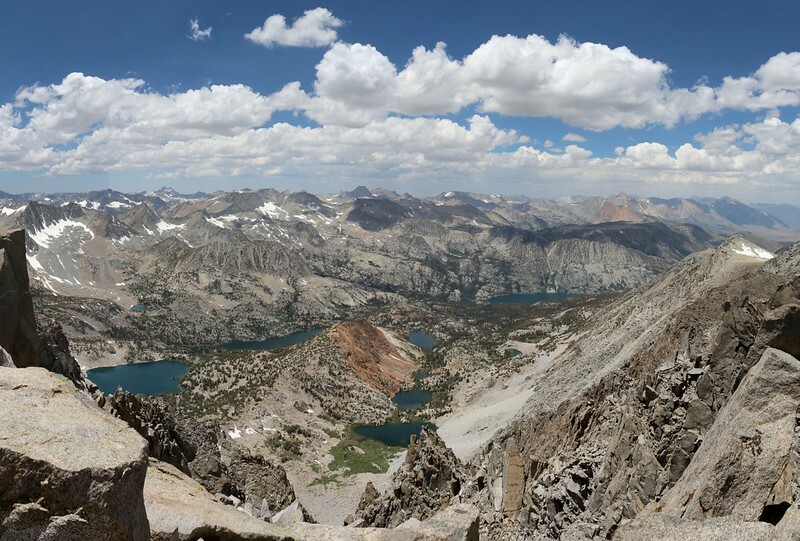 And I was really happy with the weather – all those cumulus clouds made for awesome pictures, and none of them appeared likely to grow into thunderheads, which is always comforting when standing on a mountain named Cloudripper, not far from a lake named Thunder and Lightning Lake. 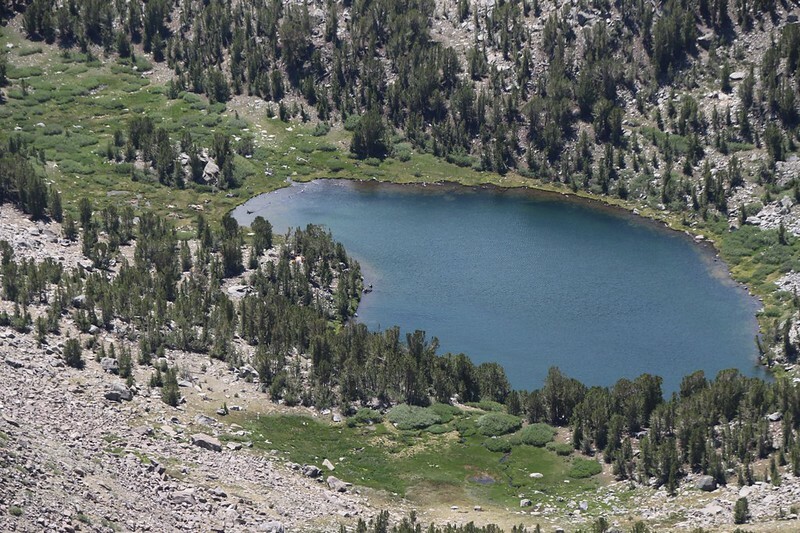 I was particularly excited to be able to see down into the Bishop Creek drainage, where there were many lakes that Vicki and I had hiked along back in 2011 on our way to Bishop Pass and Dusy Basin. 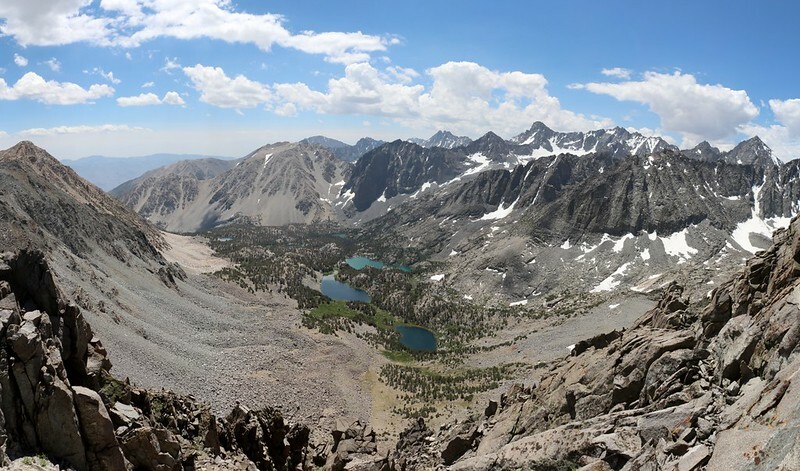 The views east toward White Mountain Peak, and south into the Big Pine Creek Basin were equally impressive. As the three young ladies told us yesterday, from up here you really could see everything! It was a bit after 1pm, so we decided to eat our lunch up there. 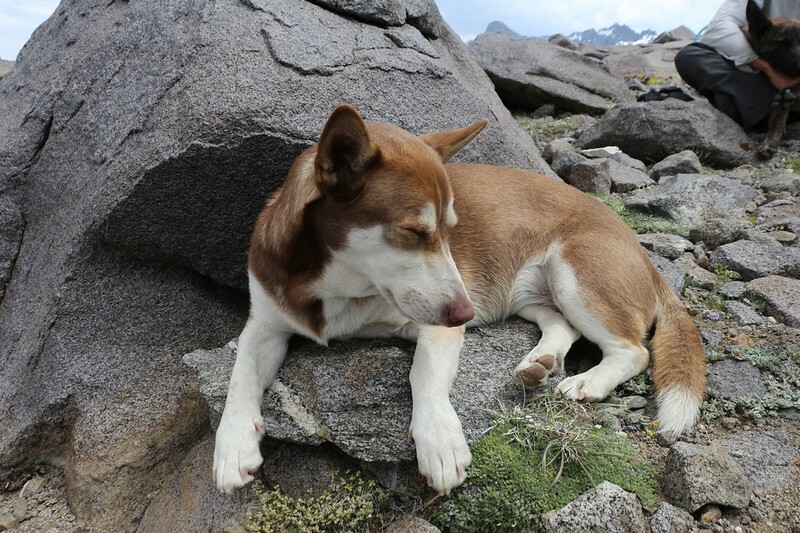 All told, it had taken us four hours to reach the summit, which was certainly sobering. We’d only traveled one and a half miles (plus a half mile straight up), which yielded an average speed of only 0.4 miles per hour! That was even worse than what we’d seen back at the saddle. 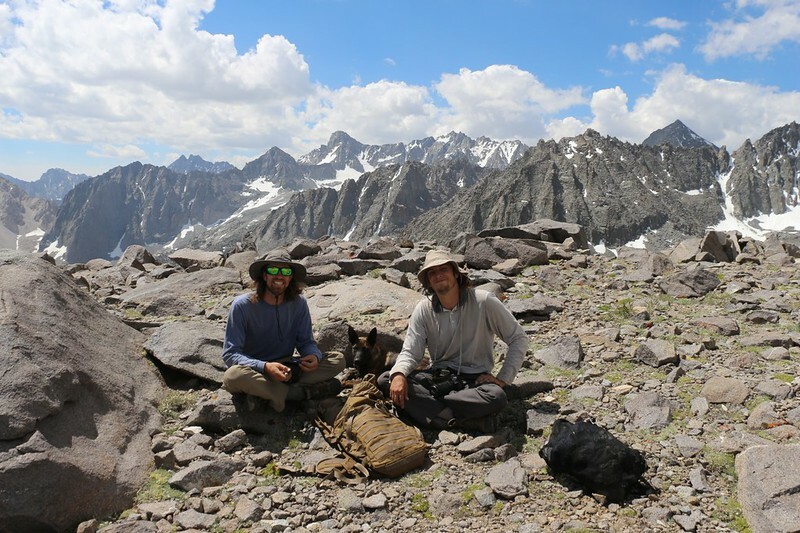 We all agreed that we were pathetic, that we should have done much better than that, and we wanted to blame the rocks and the dogs and the thin air, but with a view like that all around us, we didn’t really care any longer. It was days like this that made life worth living, and we weren’t going to regret or be sorry about any of it. Sadly, all good things must come to an end, and we eventually had to leave the summit. It was getting cool just sitting there in the breeze, and it was already afternoon. So we started the long trek down the ridge to the saddle. The descent went a bit faster than on the way up, mainly because we paused less often to catch our breath, but our hiking speed wasn’t much different. Those big talus blocks command respect, and you have to remain focused at all times. Just the same, along the way my son attempted to shoe-ski down a large snow slope, but mainly succeeded in sinking into the soft snow up to his knees. The one time he really got going he wound up doing some kind of crazy cartwheel and almost landed on some exposed rocks. That pretty much ended the snow foolishness. 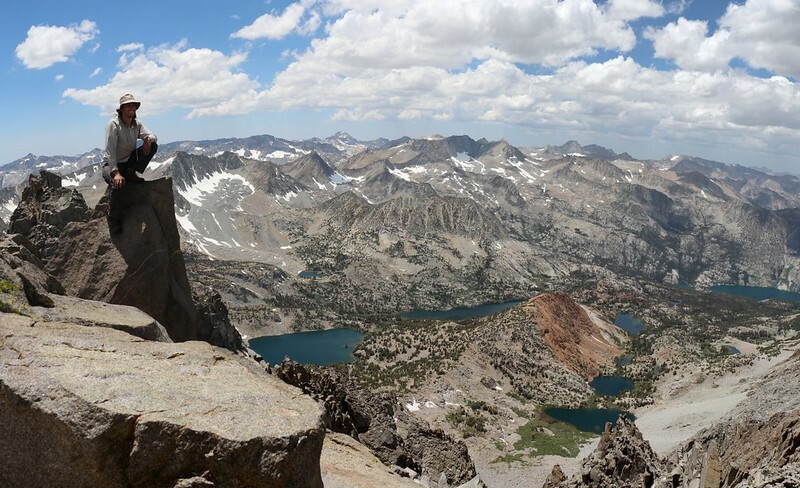 We took another good break at the saddle, and simply enjoyed the view for awhile. We knew that soon we’d be back down in the valley, and the grand vistas would be over. This was our last chance, in other words, so we took full advantage of it. It turned out that the dogs rested more than we did. All that rock-jumping was tough on the pups. They’d rather run and play. But they’d have their chance soon enough. 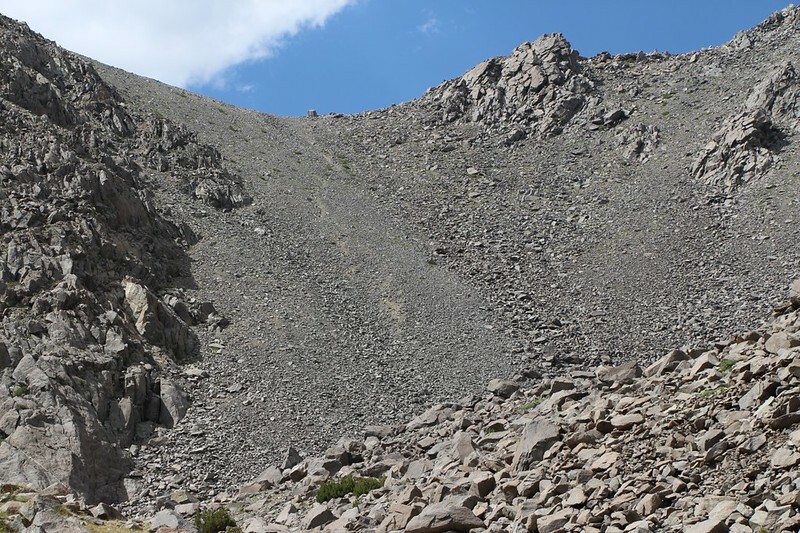 Our plan for the descent from the saddle was to stay on the loose scree section on purpose, rather than on the firm talus blocks like we did on the way up. 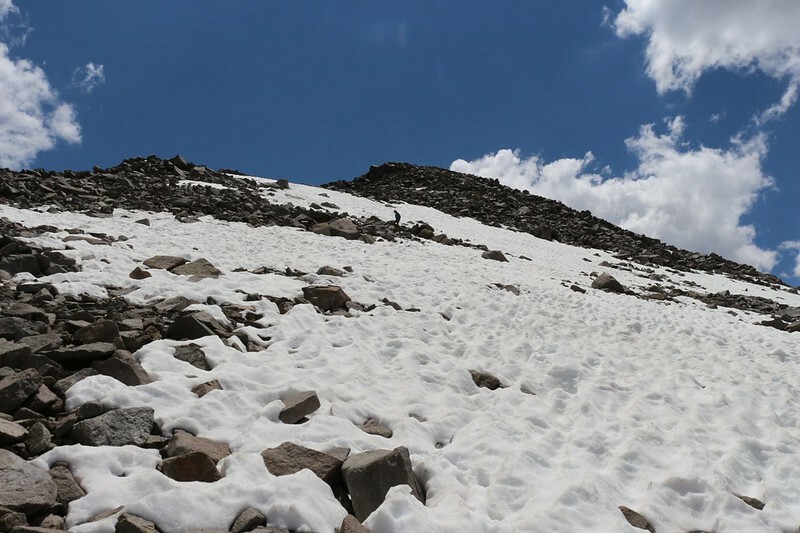 We intended to shoe-ski our way down the scree slope. This took plenty of concentration and balance, but it was the absolute fastest way down. And it was way more fun! Eventually we made it back to the grassy slopes that led down to the lake. The dogs were happy again, racing around and chasing each other. No more scary rocks! The three of us paused and looked back up at the saddle. It was obvious where we’d slid down the slope, but we knew that we weren’t the first to do it. It had been evident on the way down that we were following a trail made by other crazy people much like ourselves. We got back to camp and took another break, but not a big one. We filtered some water for dinner (and tomorrow’s hike) and then headed back to the shore of the lake. It was late afternoon but the sun was still warm and high. I took my shoes off and dipped my feet in the lake for a while, enjoying the view and reading my book. The guys, meanwhile, decided to wade out into the lake. The water was cold, but not freezing cold. It didn’t take all that long before their legs got used to it. Or numbed to it. “Twenty bucks is twenty bucks,” we said, laughing. He nodded in agreement. We were right. So we got our cameras ready as he mentally prepared himself for the plunge, then started recording. He dove in and hooted a bit as he surfaced. It was cold, but not painfully cold. In fact, he began to enjoy it. Especially knowing that he was making twenty bucks to get clean and have fun. After he came out and stood by the shore, drying in the sun, it was Evan’s turn to take the twenty-dollar dare. And he didn’t shrink from the opportunity. He, too, jumped in and had a quick bit of fun. After he came back out, they both looked at me. If I jumped in, all the money would be cancelled. But I wimped out. Sorry, boys, but dipping my feet was more than enough for me. Yes, this was the good life.